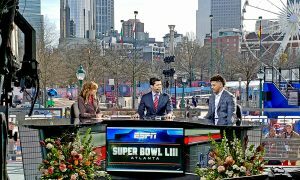 ESPN’s efforts during Super Bowl Week make the network a force across Atlanta. It has a main presence at Super Bowl Live, located in Centennial Park, as well as two studios on the fourth floor of the AmericasMart, where Golic and Wingo, First Take, and Stephen A. Smith’s radio show were on location through Friday morning. As of Saturday, all of the ESPN activities shift to the 32×32 sq. ft. stage at Centennial Park. 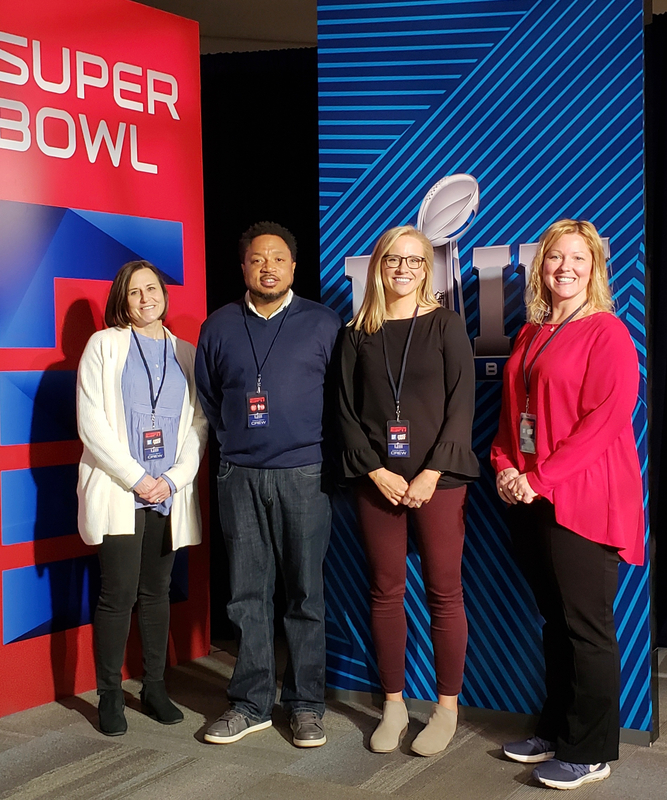 From left: ESPN’s Kim Bloomstone, Carlton Young, Jill Clark, and Cindy Pennington oversaw operations for two sets at AmericasMart at Super Bowl LIII. Both locations give fans plenty of chances to engage with the ESPN programming efforts, according to Carlton Young, operations manager, ESPN. The two sets in AmericasMart are located next to each other in the same ballroom so it is easy to share and transition cameras and other equipment from one show to the next. In addition, the production teams for the shows are able to share Mobile TV Group’s 27 HDX unit, which has dual-feed capabilities. 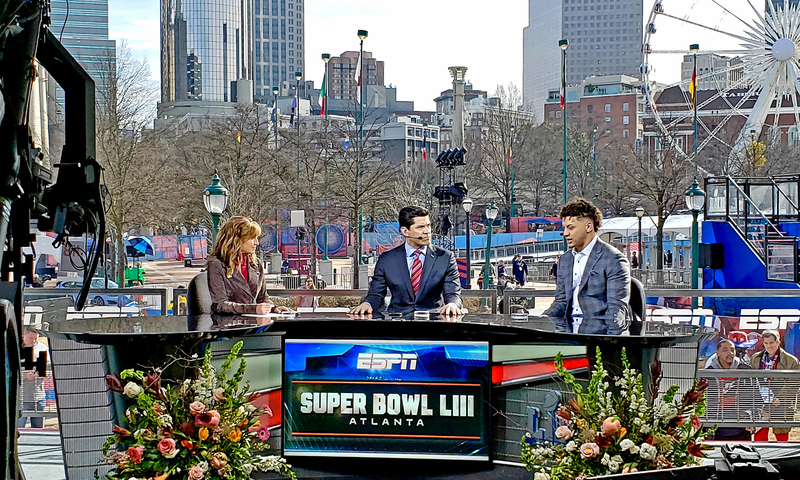 ESPN’s Super Bowl LIII set at Centennial Park will be right in the center of the Super Bowl buzz this weekend. The Centennial set is located a five-minute walk away, giving a new level of flexibility for the teams, which have been able to easily share guests, equipment, and anything else. Harb Production Services is providing the remote-production unit for the set in the park, and, tomorrow and Sunday, ESPN will find itself right in the center of things as the New England Patriot, Los Angeles Rams, and NFL fans descend on Super Bowl Live to experience some Super hype. “It has natural fan engagement and also the ferris wheel, Atlanta skyline, and giant Super Bowl trophy as a backdrop,” says Young.